There are a myriad online marketing options for local businesses to attract visitors to your website and convert those visitors to leads and sales. According to MOZ, there are approximately seven billion unique local searches each month on Google in the United States. 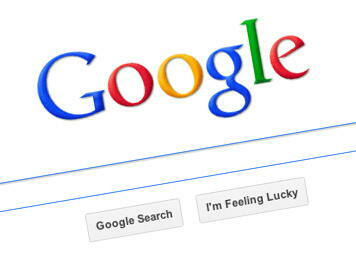 In 2009, Google began showing local results for generic queries. That means Google can identify if you’re sitting in Raleigh or Houston or Timbuktu and searching for or a pet store, and without you adding the geographic identifier, Google will automatically focus your results on local. Business owners can easily capitalize on these searches with local intent by buffing up their local search presence. Below are six quick, useful tips to get you started in ranking well in local searches. Google continues to increase its emphasize on delivering “blended” search engine results. "Blended" results incorporate a number of non-website characteristics into Google search engine results pages. The goal is to deliver you, the search engine user, the content most relevant to your search query as quickly as possible. This ongoing shift in search engine results is critical for restaurants and other local businesses. Characteristics such as user reviews or business information frequently show up higher on a search engine results page than web pages (illustrated in the 'pet store' search engine results screenshot above). Making sure your business is listed at the top of the page isn't just about optimizing your website anymore. It's just as important to optimize your web presence. Not surprisingly, Google puts the the greatest emphasis on Google+ Local pages (formerly Google Places). 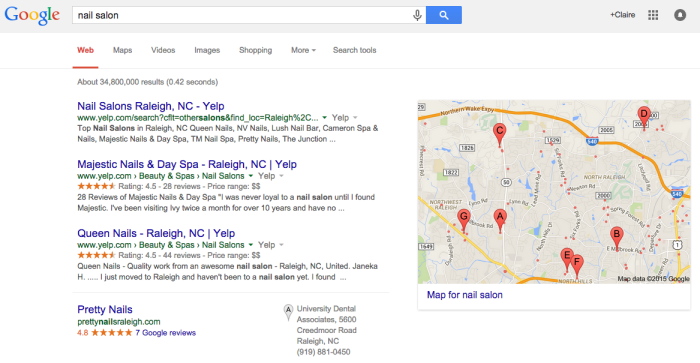 In the 'pet store' example above, three of the top four results are Google+ local pages. All you need to get started on Google+ Local is a Google Account and a mailing address for your business. Navigate to the Google My Business page and you can create and verify your local business Google+ Local listing from there. A local business listing is an online profile containing your business name, address, phone number, and other details. Claiming a listing of your business verifies that you are the owner of the business and that you are authorized to maintain its presence on the web. Google+ Local is the most important place to start, but there are thousands of websites and directories on which local business owners are allowed to create free business listings. Yelp, Bing Places, Internet Yellow Pages, and Yahoo! Local are all good places to look to claim your local business listing. Moz Local put together a useful step-by-step guide to verifying your local listings. Reviews make up 10% of Google’s local search algorithm. Take a look at the 'pet store' example again. The first listed result (Pet Mania) has a slightly worse rating based on reviews than the third result (Woof Gang Bakery.) It is also the longest drive from my current location. But, with three times as many Google+ Reviews as its competitors, it is listed first. Businesses with a number of positive Yelp reviews also typically show up higher in search engine rankings. In fact, a business's Yelp page often ranks higher than the business's own website. Beyond just the SEO benefit, positive reviews online also help to build trust and credibility. However, it's important not to force or bribe customers for reviews. You can encourage them gently by including your Google+ Local or Yelp URL on receipts or posted in the store. In SEO lingo, your business’s NAP refers to your business Name, Address, and Phone number. You can think of it like your business's online thumbprint. Keeping these consistent is critically important for Local SEO. For example, you wouldn't want your address listed as '555 Person Ave.' in some places and '555 Person Avenue' in others. The consistency with which your local business NAP information is published across your website and various business listings influences search engines' trust in the validity and accuracy of this data. Consistently creating compelling content is one of the cornerstones of a successful search engine optimization campaign, and it's no different for Local SEO. Each relevant, well-written post or page on your website is an opportunity for your site to rank in Google. Keeping up with a blog is a great opportunity to regularly write and post information about your industry using local topics and keywords to attract local search engine users. For example, if you managed the website for Todd's Raleigh Flying School (NMC's resident airline pilot,) you could post a blog about the best runways to land on in North Carolina, North Carolina pilot license regulations, or the top 5 restaurants around the Raleigh Durham Airport. The key is you want to position yourself not just as an expert in your field, but in your town as well. Click here to learn more specifics about Blogging for SEO. As you're thinking about Local SEO, it's important to keep in mind that successful Local SEO should come at the heels of a well-implemented traditional SEO strategy. All the same rules apply. A site that was built on a search-engine friendly CMS, loads quickly, and has error-free code is much more likely to rank higher than a site that isn't. By starting with a solid foundation from an SEO perspective, you can be sure the time you put in to optimizing your site for Local SEO will provide the biggest return for your business. What Local SEO strategies have you found successful? Let us know in the comments. Also, if you feel like you don't have the time to manage your campaign, you should get in contact with us to see how our online marketing services can help you. Major traditional ways to do SEO is building a site with unique and target content that is easy for web spiders to index. It can help greatly while doing local SEO. Traditional way to do SEO,is building a site with unique and target content that is easy for web spiders to index.It can help greatly while doing local SEO.